Sue Streatfield has been appointed as a partner within Clarion’s expanding intellectual property (IP) practice, just two years after joining the firm. Clarion has one of the largest teams of specialist IP lawyers in a full service law firm in the North. With over 17 years’ experience in IP law, Sue’s career includes spending three years with a large Australian commercial law firm as well as having worked for Eversheds. Sue joined Clarion from Bond Dickinson’s IP team, where she worked for seven years before joining Clarion in December 2015. Sue has substantial experience of advising a wide range of clients, from small start-up businesses to large international corporations, on all aspects of IP law, including litigation, research and development agreements, licences and assignments. She has particular expertise in pharmaceuticals, life sciences and chemicals, and has played a key role in growing Clarion’s specialism in these areas. Sue also advises clients in the engineering, digital, university and retail sectors. 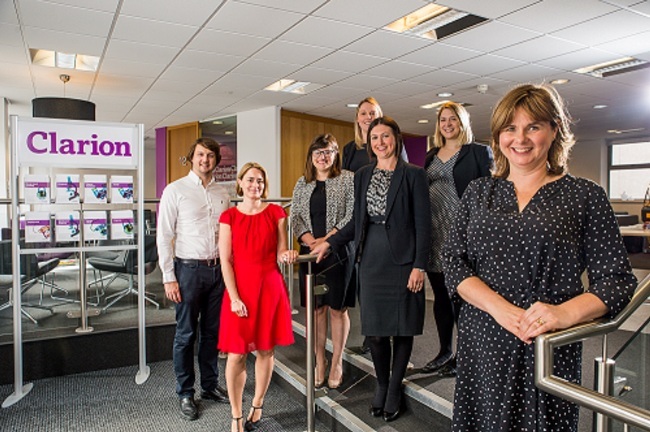 “With her strong track record in pharma litigation and IP commercialisation agreements, Sue has brought a wealth of knowledge to the firm and helped spearhead our growing presence in this specialist sector,” said Roger Hutton, joint managing partner of Clarion. Sue has written and presented IP law courses for one of the largest law schools in the UK and contributes to various IP publications.